The Tobin Music System is a unique method of teaching children all about music from the age of 4 onwards. This multisensory approach to learning equips the young child with the foundation skills of reading, writing and numeracy and thus prepares them for their academic career. In the tiny steps course chidlren between the ages of 4 and 6 learn their note lenghts, the pitch of the notes right across the great stave, bars and bar lines, time and time signatures. They finish up writing their own little sixteen bar tunes harmonised with major and minor chords. 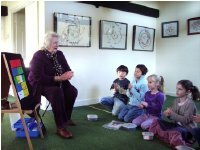 A series of weekend and afternoon 45 minute classes, costing £5 per child, are scheduled to commence in Wellingborough Northamptonshire Autumn term 2010. This class follows on from Tiny Steps. Children develop all the skills required to get them to the level of composing. They learn all the notes across the great stave, time signatures, finding chords, harmonisation and how to notate the music accurately. The programme also develops aural skills alongside music literacy. Parents attend classes with their children at this stage because we believe it is important for them to learn alongside the children. In this way, the children subconsciously understand that learning is something enjoyable that they can share with their parents. "I wish I had the opportunity to learn about music this way when I was Sarah's age! We really engoy the classes and music should definitely be taught in schools this way. Everything is built up really logically so you understand why notes look like they do, etc. "Learning from the Saturday morning class continues all week as we sing the songs to each other at home, use the notes, look at the workbook etc. Sarah also sometimes does a Tobin Music class for her dolls and teddies!"